Zolani Mahola is a South African singer and actress best known as the lead singer of the band Freshlyground, since 2002. She is known to television audiences for her role as Boniswa in the first three seasons of the SABC1 youth drama series Tsha Tsha, from 2003-2005. She was born in the Eastern Cape Province of South Africa where she grew up near the city of Port Elizabeth, in Bhisho. She moved to Cape Town and studied drama at the University of Cape Town. In 2010 Zolani was a guest judge during the Cape Town auditions of the M-Net reality singing competition Idols. 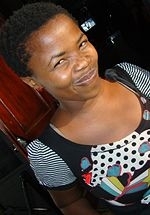 A documentary about Zolani and the band, entitled simply "Freshlyground", aired on SABC3 in March 2011. In 2013 she was a celebrity teacher on the M-Net docu-reality series Dream School SA.